Doctoral graduate Dr Shayne Baker OAM was awarded the Royal Life Saving Society (RLSS) Certificate of Merit for the second time on the 22 November. To commemorate the 125th anniversary of the RLSS, Dr Baker is just one of 125 individuals around the Commonwealth to be awarded with this special edition of HRH Prince Michael of Kent Merit Certificate in recognition of his significant contributions to society. “My nomination was a complete surprise to me. It was in recognition of my contribution in the four criteria of drowning prevention, administration, training and sport,” says Dr Baker. Dedicating much of his life to lifesaving, one of Dr Baker’s most notable achievements was establishing the Philippine Lifesaving Society during his time as President of the RLSS. 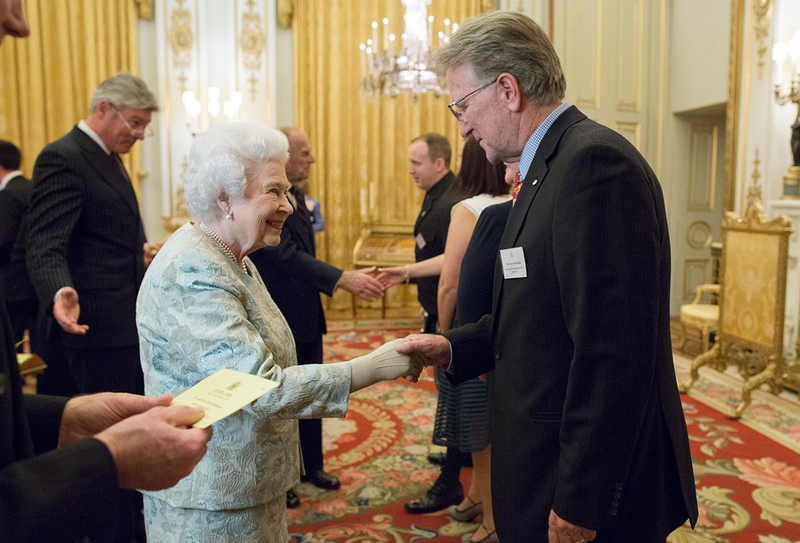 Dr Baker, who is an expert in vocational learning in Australia, made the long haul from Queensland, Australia to Buckingham Palace to be congratulated by HRH Queen Elizabeth and the Duke of Edinburgh. During his time studying Professional Studies by Public Works at Middlesex’s Institute for Work Based Learning from 2011 to 2013, Dr Baker also received the Order of Australia for services to life saving. He is now an associate member of staff at Middlesex University.